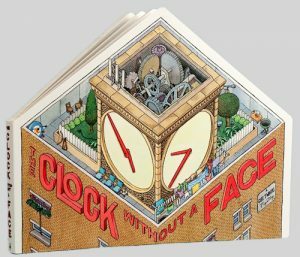 The Clock Without a Face is a frustrating armchair treasure book because so many of the puzzles are ambiguous with no clear solution. In many cases, the answer could only be confirmed by going and digging up the treasure. This option is, of course, no longer available. In Part 1 of this solution, I pointed out where the 12 objects stolen from each resident could be found hidden in the book. I also explained, as best as possible, the way to find the hiding places for the first 6 numbers of the clock itself. This post works through the final 6 numbers from the clock and the problem of the missing number 12 from Floor 9. A reminder to please support the Internet Archive: Wayback Machine if you find the archived links in this post useful. The US State on Floor 6 is Ohio. The three paintings on the wall of the toilet show someone saying “Oh”, then him saying “Hi”, then back to “Oh”. Oh-Hi-Oh. The checkerboard pattern on the floor of the main room has 76 squares in it. This is the highway. The letters XLV are written on the left wall of the main room. They are very obscure, using a “figure and ground” type trick, but pretty clear once you see them. These Roman numerals give 45 as the distance. The number from floor 6 was found about 45 miles along I-76 in Ohio. The archived copy of the official website reports that the number 5 was found in June 2010. The US State on Floor 5 is Illinois. 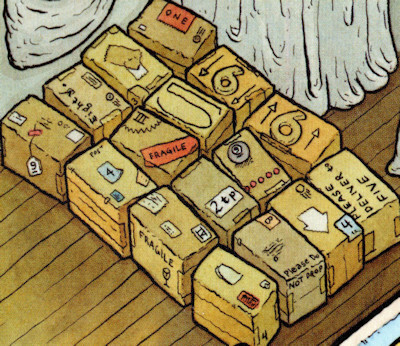 The square of boxes at the right side of the room all have numbers written on them. It is a semi-magic square as the rows and columns, though not the diagonals, all add up to 21. The 21st State to join the Union was Illinois. The book under the kitchen table leg has the number 39 written on it. This is the highway. The copy of the Clock Without a Face on the kitchen table is open on Floor 2. This is the distance. You can confirm the number 2 in several other ways: 2 occupants, who moved in 2 years previously. The number from floor 5 was found about 2 miles along I-39 in Illinois. The archived copy of the official website reports that the number 8 was found in May 2010. The US State on Floor 4 is Maryland. The music on the piano in the main room has two notes on it separated by a minor 7th interval. Ambiguously, this is also an augmented sixth, but 7 is the correct answer. Maryland was the 7th US state. The thermometer in the main room is a shocking 95 degrees. Presumably fahrenheit rather than celsius, but still pretty damn hot! This is the highway. The distance is 81. The best way I’ve found to reach that answer is to look in the “gym” room. On the wall there is an octagonal (8-sided) clock with the hand pointing approximately at 1. The number from floor 4 was found about 81 miles along I-95 in Maryland. The archived copy of the official website reports that the number 1 was found in September 2010. The US State on Floor 3 is California. The paintings around the kitchen sink are associated with California. For example, on the left is Cakes by Californian artist Wayne Thiebaud. On the right is Mickey Mouse and Disney is headquartered in California even if their largest theme park is in Florida. The highway is indicated by the strange orange sculpture to the right of the main room. In cross-section, this sculpture is in the shape of the chinese character for 5. The mirror at the rar right of the main room has the number 445 in reverse in it. This is the distance. The number from floor 3 was found about 445 miles along I-5 in California. The archived copy of the official website reports that the number 11 was found in May 2010, the first digit to be found. The US State on Floor 2 is Texas, as indicated by the boxes of chili in the bedroom, each with a white star on the front. The highway is indicated by the tally marks beside the bed, adding up to 35. The distance is 180. There are 4 digital clocks on the wall of the bedroom. One of them reads 1:80, which is out of place. The number from floor 2 was found about 180 miles along I-35 in Texas. The archived copy of the official website reports that the number 9 was found in June 2010. The US State on Floor 1 is Virginia. The three paintings in the bedroom all illustrate people associated with that state, Thomas Jefferson, Dave Matthews and Missy Elliott. The highway is found in an incredibly obscure reference to a 1981 Major League Baseball strike. A newspaper article about the strike is on the wall in the entrance hall, with a headline reading “Strike Over: Baseball Resumes Aug. 9”. From this, you were supposed to get the number 81. The number 262 is hidden in the paisley pattern on the rug in the main room. This is the distance. The number from floor 1 was found about 262 miles along I-81 in Virginia. The archived copy of the official website reports that the number 4 was found in June 2010. As reported in part 1 of this solution, the clues to the missing number 12 led to I-84 in Idaho. Instead of a buried number, however, there was a note saying that Roy Dodge had already found that number and taken it for himself. The next part of the puzzle to find the missing 12 was to locate Dodge himself. There are few obvious clues to Roy Dodge’s location in the book. The most important is on Floor 3. Dodge says that, with enough money, he would retire back home to Washington and fish every day. Wikipedia reports that there are around 30 places called Washington in the US. Another clue is on Floor 6. Here, Dodge recounts chasing a mime out of the back porch of a hotel into a river. I am not sure what other clues there are to narrow down the search, but Roy Dodge’s hiding spot was Washington, California. It is a tiny town of about 180, and the Washington Hotel backs on to the Yuba River. An old gold mining town, it’s focus now is on tourism and there’s probably little to do there except fish every day. The story of how the number 12 was found is recounted on this archived copy of the official website. It took until June 2012 to track it down, over a year after the note at the Floor 9 burial spot was unearthed. And even then it was by sheer chance that the treasure was found. The person who eventually got their hands on the treasure had decided, for whatever reasons, that Washington, California was right place. Instead of mounting a personal search, they emailed the Washington Hotel asking if someone called Roy Dodge had ever stayed there. The hotel owner replied in the negative, but said that they were also the postmaster in town and that, a year previously, a package had arrived with instructions to give it to the first person requesting a parcel for Roy Dodge. The treasure hunter drove half way across the US to claim the package, which did indeed contain the missing number 12, and left her copy of the Clock Without a Face with the bemused locals. So there you have it. That is the full solution to The Clock Without a Face as much as I have been able to piece it together.